I'm a big fan of the No.1 Ladies Detective Agency series, but McCall Smiths new book has nothing to do with that storyline. 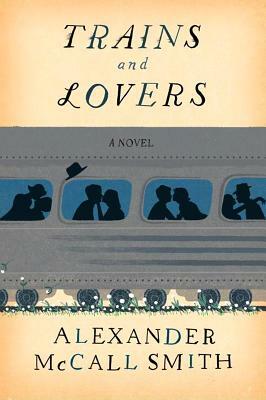 'Trains & Lovers', a quick, sweet read tells teh story of four strangers who meet by chance on the train journey from Edinburgh to London. What happens to them along the short journey might happen to any of us. The four reveal themselves to eachother in the course of conversation about their lives. Unlikely to see eachother again, they are nonetheless altered by their brief encounter. A great summer read! The rocking motion of the train as it speeds along, the sound of its wheels on the rails . . . There’s something special about this form of travel that makes for easy conversation, which is just what happens to the four strangers who meet in Trains and Lovers. As they journey by rail from Edinburgh to London, the four travelers pass the time by sharing tales of trains that have changed their lives. A young, keen-eyed Scotsman recounts how he turned a friendship with a female coworker into a romance by spotting an anachronistic train in an eighteenth-century painting. An Australian woman shares how her parents fell in love and spent their life together running a railroad siding in the remote Australian Outback. A middle-aged American patron of the arts sees two young men saying goodbye in a train station and recalls his own youthful crush on another man. And a young Englishman describes how exiting his train at the wrong station allowed him to meet an intriguing woman whom he impulsively invited to dinner—and into his life. Here is Alexander McCall Smith at his most enchanting, exploring the nature of love—and trains—in a collection of romantic, intertwined stories. Alexander McCall Smith is the author of the No. 1 Ladies Detective Agency series, the Isabel Dalhousie series, the Portuguese Irregular Verbs series, the 44 Scotland Street series and the Corduroy Mansions series. He is professor emeritus of medical law at the University of Edinburgh and has served with many national and international organizations concerned with bioethics. He lives in Scotland."